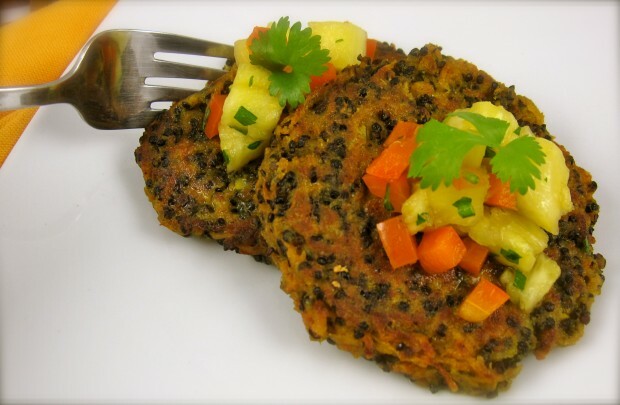 This is one of my nutrition-minded husband’s favorite meals; a health-property-on-steroids recipe: Quinoa and Sweet Potato Cakes. So good for us, in fact, I took the liberty of frying instead of baking them. But I only used a few tablespoons of grape seed oil for the entire batch and, to my palate, the resulting flavor is far better than the cakes I’ve baked in the past. These cakes can be served as an appetizer or as a main course, depending on how big you choose to make them. They take a bit of time to make, but yield a massive, healthy bang for the buck. In a medium-sized bowl combine eggs, curry, ginger,garlic, salt and cayenne. Stir in cooked quinoa and sweet potato and thoroughly combine with wet ingredients. Refrigerate at least 30 minutes to 2 hours. Preheat oven to 200 degrees. Make a salsa by combining pineapple, bell pepper, brown sugar and cilantro. Reserve. Heat 2 tablespoons oil in a large, nonstick pan over medium heat. For appetizer-sized cakes, drop heaping tablespoons of the quinoa mixture into the pan; for main-course servings combine 3 tablespoons quinoa mixture for each cake and place in pan. As cakes cook, flatten each cake into a pancake shape with a spatula. Cook cakes, in batches, adding more oil to pan if pan becomes dry. Cook 1-3 minutes on one side, carefully flipping cakes with a spatula when golden brown then cooking on other side until cooked through, and golden brown. As cakes are done, place on a paper-towel lined cooking sheet in warm oven until ready to serve. Garnish cakes with a dollop of pineapple salsa and cilantro sprig before serving. *Approx. 1/3-1/2 cup dry quinoa cooked according to package instructions yields about 1 1/2 cups cooked quinoa. More Recipes Filed Under "Feed Your Wallet"